House of Cards Season 2: Frank Underwood has no worthy enemies. The false hubris and grandeur of House of Cards, Season 2. 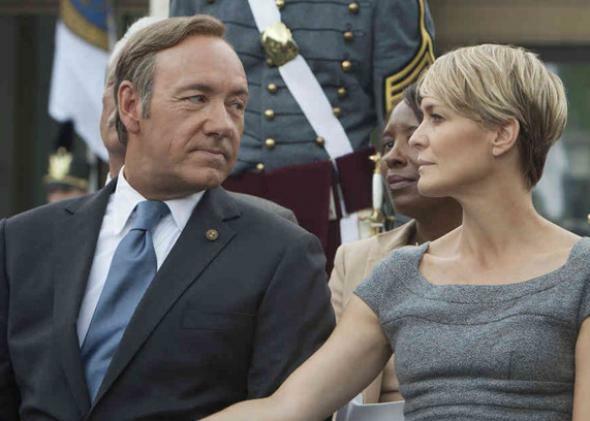 Kevin Spacey as Frank Underwood and Robin Wright as Claire Underwood in House of Cards. On Feb. 13, the snowbound and sleet-plagued Washington establishment spoke with a single voice: Netflix needed to release House of Cards a day early. “Release House of Cards a day early and you will have millions of grateful snowed-in customers,” wrote one Washington Post reporter. “Netflix would be smart,” agreed Sen. Marco Rubio spokesman Alex Conant. By the afternoon, CNN’s media reporter Brian Stelter was analyzing the “House of Cards backlash” and its obvious high-stakes challenge to Netflix. It did sound insufferable, but was it wrong? No. House of Cards and official Washington have achieved symbiosis since before the first episodes started streaming last year. The show premiered last year at the Newseum, where showrunner Beau Willimon and co-stars Kate Mara and Kevin Spacey were introduced to important journalists. (I can confirm this because Spacey sidestepped my compliment about his old role on Wiseguy so a handler could match him with Howard Fineman. For the record, Space was terrific on Wiseguy.) Spacey became Washington’s new BFF, appearing in a spoof video for the White House Correspondent’s Dinner, which he attended. President Obama started winning rare, friendly headlines by talking about the show and asking Twitter not to spoil Season 2. And the real-life media are all over House of Cards’ second season. There’s Major Garrett, the big-thinking White House reporter for CBS News, describing the latest problems of President Garrett Walker (Michael Gill). There’s Rachel Maddow giving exactly the sort of monologue she usually gives in her A-block, describing why Frank Underwood (Spacey) was an uninspiring pick for vice president. Hey, and there’s CNN’s Ashleigh Banfield conducting an interview with Claire Underwood (Robin Wright) that dramatically pivots the series. In Veep, an almost identical role goes to Alison Janney, who, yes, is still largely famous from her role on The West Wing, but who isn’t about to interview Charlie Rangel. The problem in House of Cards is that Frank’s still the best at this. Do you, viewer, ever really fear that Frank Underwood’s going to lose? That he’ll be caught? No, the thrill is in guessing how he’ll evade the noose. There’s nothing wrong with that—not every show, sadly, can be set during a zombie apocalypse—but this noose isn’t even tied right. In the first episode of the new 13-part series, Underwood dons a fedora, sunglasses, and a black coat to meet with Zoe Barnes (Kate Mara) the inamorata/unethical reporter who knows enough to nail him. Republicans, chiefly one Tea Party senator, worry that it will deprive them of a “win,” and a key Republican, we’re told, was re-elected after the Tea Party “dumped $10 million” into his super PAC. Democrats worry about getting beaten, too. “If we raise the retirement age,” says one of them, “the AARP will raise hell.” So a fixer gives the AARP $45 million. The bill succeeds, thanks to Frank managing the Senate vote and an ally (Molly Parker, playing Underwood’s whip successor in the House) convincing fellow Democrats they’ll be blamed if the government shuts down. But they wouldn’t. In our reality, one that also includes Rachel Maddow and Ashleigh Banfield, entitlement reform is popular only with people who take lunch with Pete Peterson, and if the GOP is threatening to shut down the government, the GOP will be blamed for it. Public pressure, which probably just isn’t compelling enough to portray in a soap opera, ruins the strategies of the smartest, coldest operatives. So do the media. Willimon’s House of Cards has now surpassed its British inspiration in length and critical obsession. The media have got to be the reason for that—the British simply don’t have the same reverence for political power. Ian Richardson’s Francis Urquhart is commonly called “FU,” an oh-I-get-it joke that’s saved for a big reveal in the American series. Reporters show him no particular regard. He leaks to them and outsmarts them, but when the British series portrayed the press it was covering the whip-turned-prime minister with hostile snark. In that show’s second season, Urquhart forces the King of England (a thinly disguised Prince Charles) to abdicate because the monarch allies himself with the Labor Party, the media love it, and Urquhart wins an election anyway. In the American series, the media are completely oblivious to how Underwood cheerfully manipulates them. They turn on the president only after Underwood’s schemes have undermined him. The stars who keep showing up are inevitably spun. “You always ask the hard questions,” says Underwood to 60 Minutes lifer Morley Safer, as the journalist fails to lay a glove on him. I get why people root for this villain, but hubris and grandeur shouldn’t come so easy.